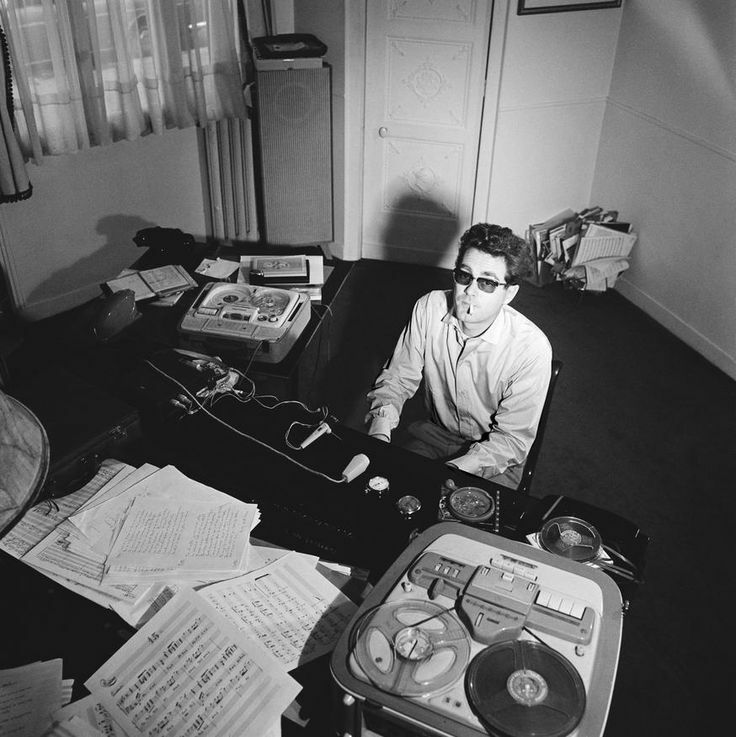 UPDATE: Yesterday, at 86, Michel Legrand passed away in Paris, France. A new post is forthcoming, but in the meantime, I thought it appropriate to bring this one back. It’s my personal favorite Legrand album and it features Legrand’s piano on all the tracks. Rest easy, Michel Legrand! Full disclosure. This post was completely inspired by the World Cup, specifically the winners of the World Cup. If you weren’t happy with the outcome of the game/series, don’t get mad at me. I’ve been looking for an excuse to profile this album, and the World Cup gave me that excuse. I’ll try not to make this post about soccer. Because that’s not the goal of my blog. So let’s dive right in to the music. Ok seriously, no more soccer references. Michel Legrand is proof that the French are just as capable of having repeat success in jazz as they are in soccer- my apologies, futbol. 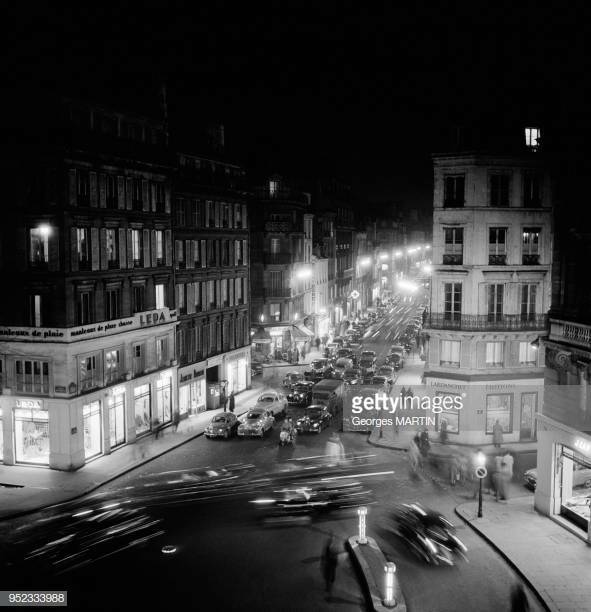 In 1954, at the age of 22, Legrand made a jazzy easy-listening album for Columbia, comprised of songs about France. 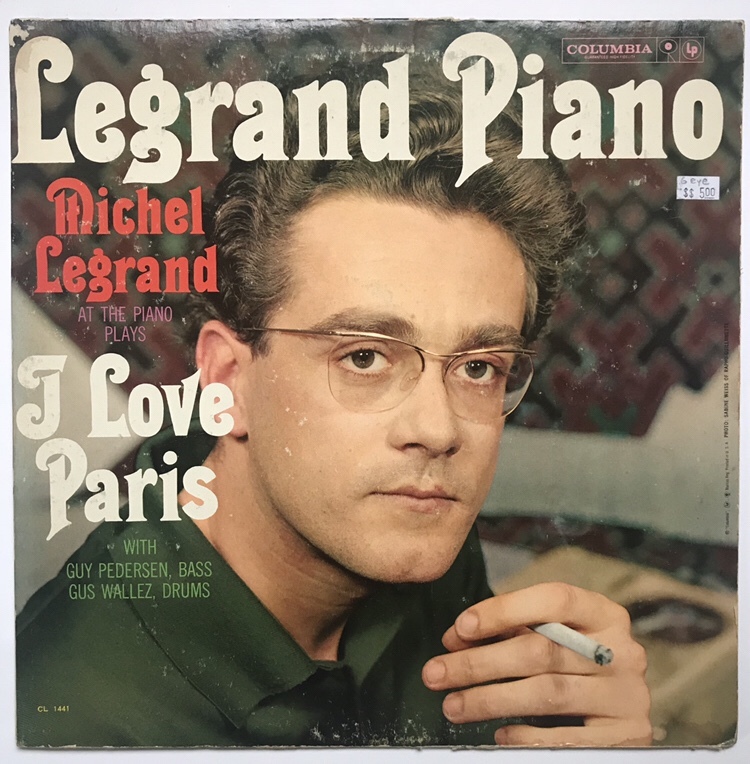 The resulting album ‘I Love Paris’ became a surprise hit and put Legrand on the map. In 1960, he decided to be daring and record the album again, but this time with a jazz trio featuring his own piano playing. While his original 1954 album was romantic and non-offensive to high-brow society, this jazzier album is in a completely different vein. Attacking the same material with a minimalist sound, Legrand crafts an album that more accurately captures the urbane, hip vibe of Paris. The songs aren’t long; most of them are less than three minutes long. However, Legrand and his trio is able to get its point across in that time span, filling the space with taste and swing. In fact, I needed a napkin, this album was so tasty. It was hard to pick one song to spotlight, so I tried to pick two. That proved to be just as difficult, so I limited myself to three. “Under Paris Skies” is pretty wild due to the unusual exploration of 3/4 waltz time. Legrand sounds like he was listening to some Brubeck, as he arranged the tune in a brisk waltz while the drummer moves freely from a fast 3/4 to a slow 4/4, and finally up to a quick 4/4 against the fleet waltz. It makes for an unorthodox ride, but just as the group starts to really swing, the song is over. “Paris je t’aime” is a fun up-tempo workout with heated exchanges between Legrand’s piano and Wallez’s bongos. I say heated, but Legrand keeps his cool the entire time, playing tasty runs and full chords in response to Wallez’s percussion barrages. “The Song from Moulin Rouge” (which I didn’t know I knew until I heard it. Where I know it from, I’m not sure…) is swung right out the gate, no frills needed. The rest of the tunes flow in much the same manner. Side 1 is much more reflective and quiet than than the second side, with “Autumn Leaves” and “April in Paris” sounding like something Debussy or Ravel would play if they had been around in the late 1950’s. Legrand’s piano technique is delicious on this album, and I wish there was more recorded examples of his jazz piano style from this time period. He has a rather streamlined, dare I say it, ‘cool’, approach to the piano that allows the music to breathe. It’s simplistic but substantial. Or, in the words of Don Draper, “simple but significant”. On bass, Guy Pedersen was a stalwart of the European jazz scene and amply shows why on this album. On “A Paris”, the spotlight is firmly on him as he plucks a haunting, moving solo. Gus Wallez’s brushwork is fantastic throughout, as well as his bongo playing on the track highlighted above. For an album containing music that “is as rapturous and exotic as a fairy tale, conjuring a world where smoldering passion co-exists alongside effortless cool”, the album cover art just doesn’t meet that standard. First, while I’m always a fan of having the actual artist on the album cover and not some random model, I’m also for GOOD photographs of the artist on the album cover. This photo, while in living Technicolor, seems to have caught Michel off-guard, looking slightly beyond the camera. To add insult to injury, they put him smack in the middle of the cover, which is the most uninteresting thing they could have done. Then there’s the font, which I don’t think is particularly hip, especially for 1960. And what’s with the different font colors? Who thought it be a good idea to make the font green against his green shirt?! The short-comings of the album cover are made worse because there were better shots taken at this photo shoot. One appears on the back of the album. Here’s another one, and one I think should have been the cover. The liner notes are brief but descriptive in explaining the music. I like reading the notes on the mono records about how they will still play on stereo equipment and won’t be obsolete. That’s part of the fun of collecting vintage vinyl. As a side note, what’s the name of this album, anyhow? Is it ‘Legrand Piano’? Is it ‘I Love Paris’? 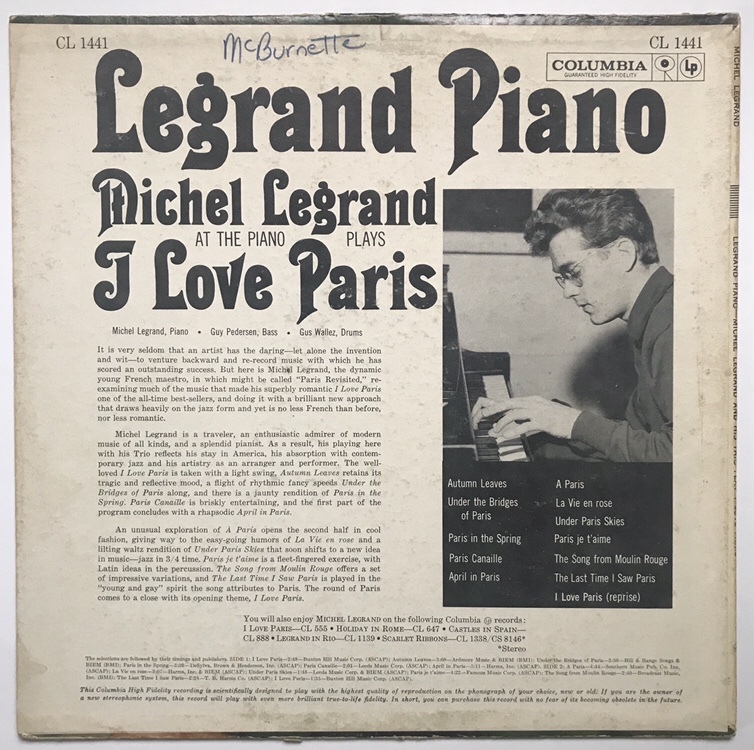 Or is it ‘Legrand Piano- Michel Legrand And His Trio Play I Love Paris’, as it says on the spine of the album? Pressed in 1960, the vinyl sports Columbia’s classic 6-eye mono labels with serious deep-groove. Side one also sports the previous owner’s autograph. The more I collect vintage jazz records, the more I’m convinced that jazz fans were kleptomaniacs or had sticky fingers. People were writing their names on the records, the album covers, the back of the albums, anywhere to ensure that people made no mistake who’s album it was. On the flip side, I suppose this means that people were freely letting their friends borrow their albums. I guess that’s what people did before you could just burn a copy for someone. This being a Columbia recording, the sound is crisp and clear. The mono sound brings the three musicians together, front and center. Some tracks sound more punchy than others, implying different recording sessions(?). I’d love to know how the stereo version compares. After visiting Atlanta, Georgia numerous times, I finally got to a record store earlier this year in March. Unfortunately, I had to go to the trendy (which means crowded) gentrified area of Atlanta known as Little Five Points. The first record store I went to was a bust in terms of jazz. Lots of over-priced used vinyl and new reissues going for $30-plus. Yikes. And this was supposed to be one of Atlanta’s best record stores. Walking a few hundred feet down the road, I walked into a smaller, more intimate record store, where I had a lot more luck. Among the gems I found there was this record. It wasn’t a record I was looking for, but one that I had listened to online and never imagined I’d find it in the flesh. Long out of print, it wasn’t even on my radar. The $5.00 price made it easy to grab, and I was pleasantly surprised when I finally made it back home and played it through. Score (I couldn’t resist). A friend and fellow record collector once told me that the cheapest records sound the best. I think he may be right. More on that in a later post. Sorry to hear that Legrand has died this week. I love this album in particular. I agree. This is probably my favorite Legrand album.